Good food, Less Meat, Good God, Let’s Eat! 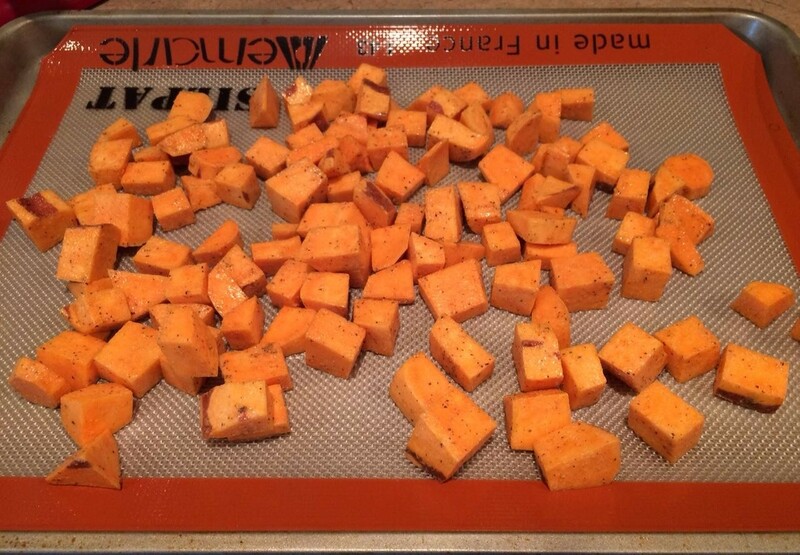 Baked Sweet Potato CHUNKS! My revised recipe! Lesson 1: Chunks cook up WAY better in the oven than your traditional cut fry! Lesson 2: More arrowroot and less oil makes for a crispier bite! I use 3X the arrowroot in this new, revised recipe! Don’t be afraid to be heavy handed! If you are thinking, “What the heck is arrowroot?” Well, arrowroot is gluten free and easily digested starch extracted from the roots of the arrowroot plant, maranta arundinacea. The starch is used as a thickener in many foods and it has vitamins, minerals, and even protein! Check it out HERE! 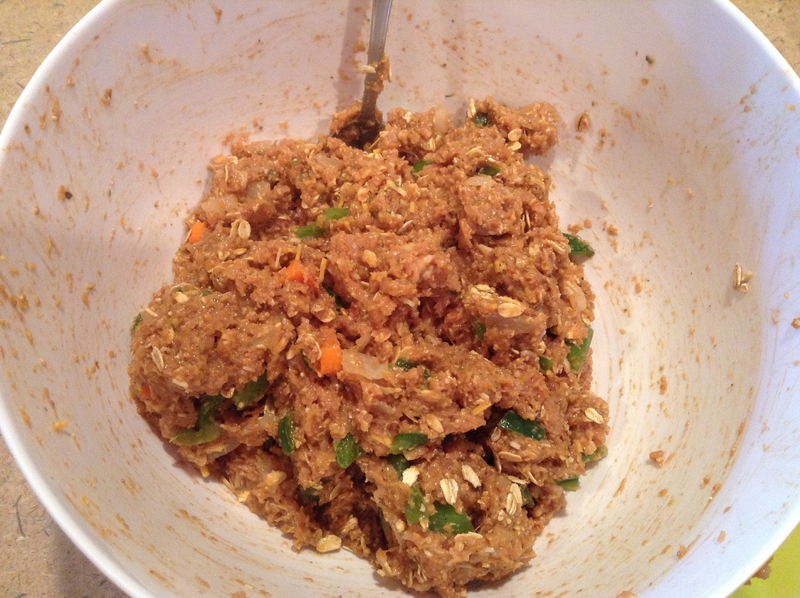 Lesson 3: Mixing in a bowl works WAY better than a gallon size bag…and it’s less wasteful! Note: You need to get the potatoes completely covered in spices and arrowroot before adding oil! A bowl is the way to go! Lesson 4: Melted coconut oil gives it an AWESOME flavor! Better than olive oil! Lesson 4: Parchment paper or a Silpat beat out using aluminum foil. Less stick…more YUM! If you are thinking, “What the heck is a Silpat?” then you are missing out!! It is a baking mat that turns anything into a non-stick surface. It is made of fiberglass and silicone and can be used thousands of times. I first saw it used on Food Network so it is professional quality! I use Silpat for any baking recipe that calls for parchment paper. Check it out HERE! I have made this recipe in this way for the past few months and it turns out perfectly every time! Now we have to resist the urge to make it everyday. HALLELUJAH! Sweet Potato Heaven! Enjoy! My favorite side dish or afternoon snack! Crunchy, soft, salty, and sweet all at the same time! Preheat the oven to 425 degrees. Line a large rimmed baking sheet with parchment paper or a Silpat. 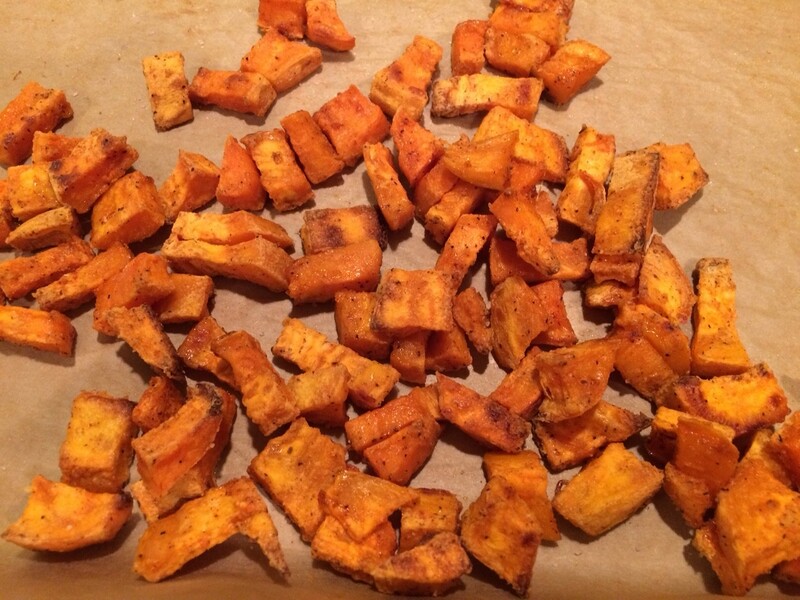 Wash and peel sweet potatoes. Dice the potatoes into around 1/2 inch chunks. The smaller you chop the potatoes, the faster they will cook. In a large bowl, combine the diced potatoes with the arrowroot and seasonings. Stir to combine. Make sure all the potatoes are coated. Pour the potatoes onto the parchment paper or Silpat into an even layer. Bake at 425 degrees for 20 minutes. Pull the potatoes out of the oven and flip the chunks using a turner. Place the baking sheet back in the oven for another 15-20 minutes until potatoes are golden brown and fork-tender. Sprinkle with a bit more sea salt. Cool and enjoy while warm! *You do not want excess oil on the potatoes. Sometimes 1 tablespoon will be too much or too little depending on the size of the potatoes. The key is that the chunks are covered on most sides with a thin layer of oil. Too much oil will leave the potatoes soggy. Ahhh it’s summer time!! 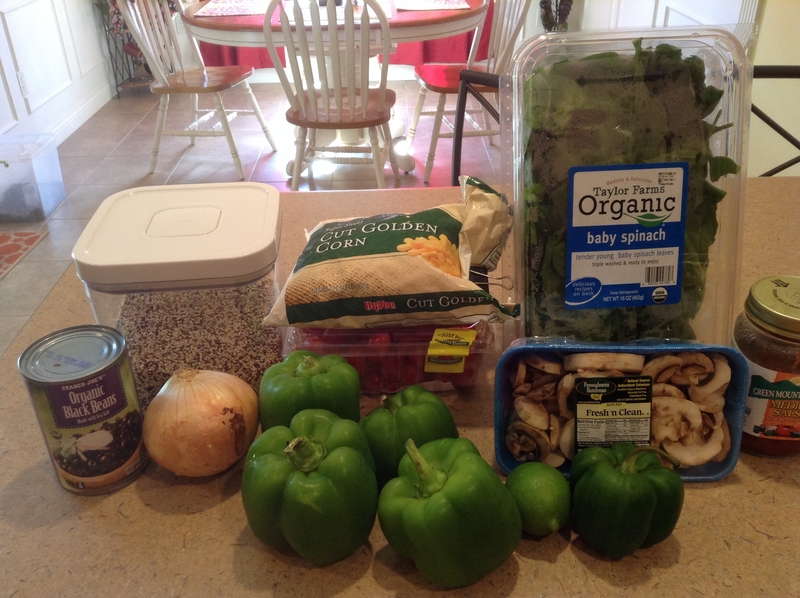 Time to enjoy fresh veggies from the garden and time to try some fun, new recipes! Last summer we were lucky enough to be overflowing with cucumbers! This pickle recipe is one of our favorite ways to use them up! They last for days and days in the fridge and actually get better as they sit in their sweet and tangy bath of goodness! This year, our cucumbers have not done as well so the farmer’s market will just have to do for now! First, in a large bowl, mix together peeled and sliced cucumbers, chopped sweet onion, green bell peppers, and a few cloves of garlic with some pink Himalayan sea salt. I like Bragg’s because it is made from delicious, healthy, organically grown apples! It is also raw and unfiltered. To sweeten the pickles, I like to use raw and local honey or Trader Joe’s Stevia Extract. The beauty of this recipe is that you can use whatever sweetener you prefer! My husband, father in law, and I prefer a more tangy pickle so I tend to use less sweetener. Enjoy! Need to use those cucumbers from the garden? Try this light summer snack! 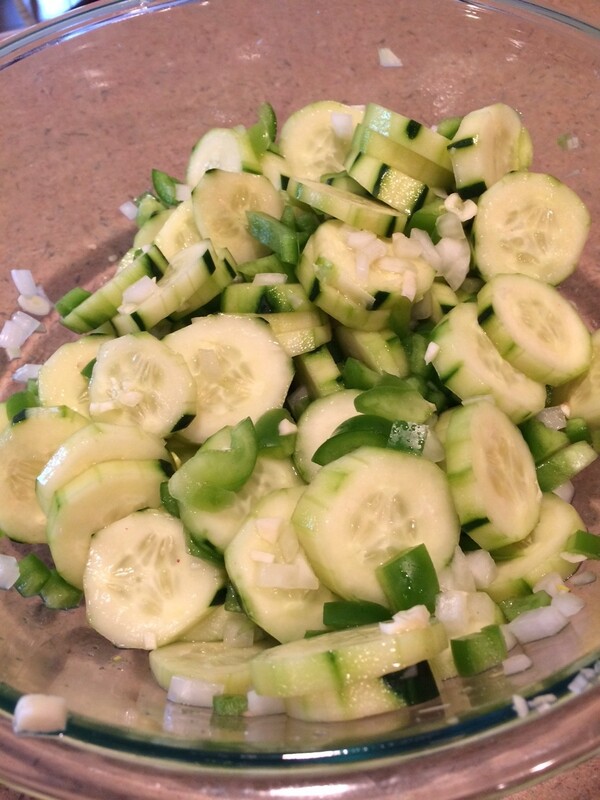 In a large glass bowl, mix together cucumbers, onions, green bell peppers, garlic and sea salt. Set aside. 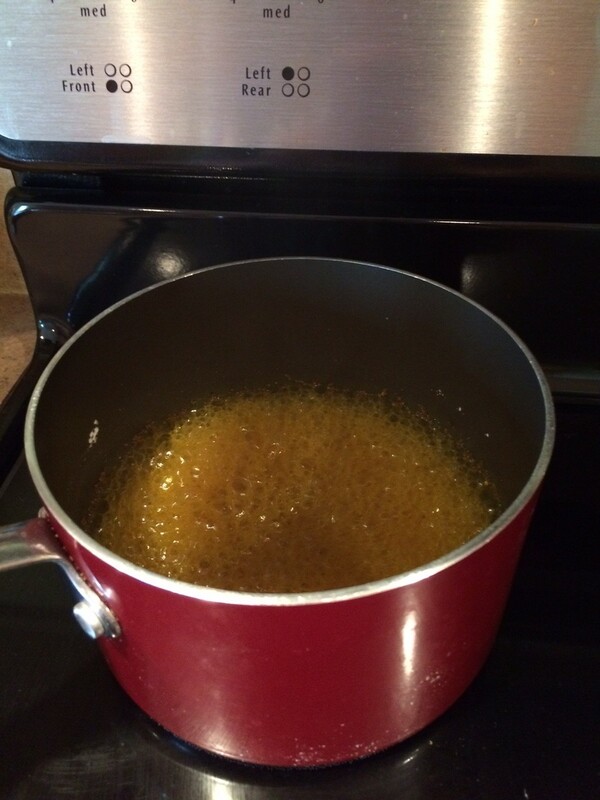 In saucepan, mix apple cider vinegar, raw honey, mustard seed, celery seed, cloves, turmeric and bring to a boil. Pour the boiling vinegar mixture into the bowl with the cucumbers and stir so they are coated. Seal quickly and allow to chill before serving. For best taste, serve the next day! For cucumbers: You can use the same amount of liquid for any number of cucumbers you would like. 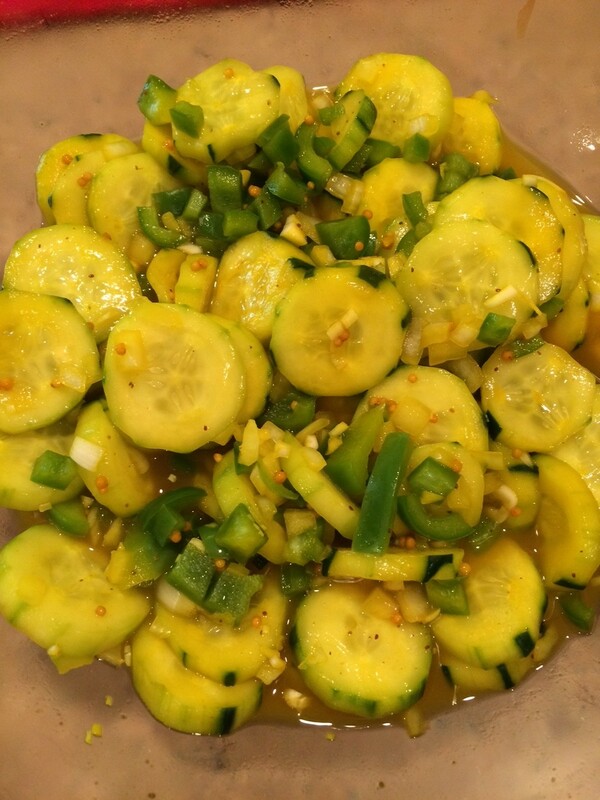 With fewer cucumbers you will have more concentrated flavor. Sometimes I will make this using only 2 cucumbers and other times I will use up to 5! It just depends on personal preference, size, and the type of cucumber you have. For sweetener: You can use anywhere from 1/3 cup to 1 cup depending on how sweet you want the pickles. Other options would include stevia in the raw, truvia, or any other type of sugar. However, I personally do not like to use these sweeteners. 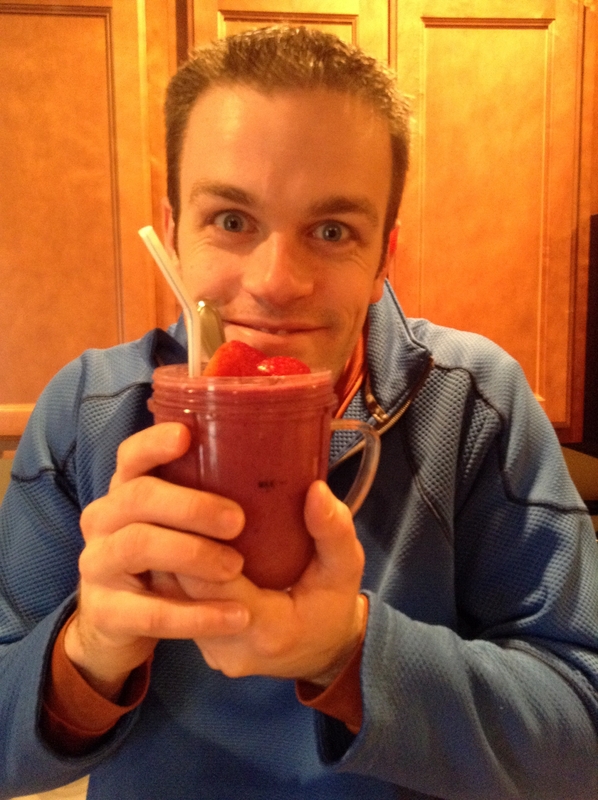 There is nothing my husband loves more after a hard workout than a refreshing fruit smoothie! My Cherry Berry Smoothie is one of his favorites! It not only provides the protein he needs for muscle recovery but a powerful, anti-inflammatory ingredient…tart cherry juice! Tart cherry juice tastes great and has many health benefits. One reason we love it is because it protects from muscle damage. According to the Huffington Post and numerous other articles, “Cherries combat post-workout soreness…a cup and a half of tart cherries or one cup of tart cherry juice can significantly reduce muscle inflammation and soreness (remember that a good workout actually causes muscle damage, resulting in inflammation). In one study a group of marathon runners drank tart cherry juice or a placebo drink twice daily for seven days prior to their race. The cherry juice group reported significantly less post-race muscle pain. Remember to have it immediately post workout when your muscles are primed to absorb excess insulin in the bloodstream.” Read more about the benefits on the Huffington Post’s website. Tart cherry juice is also a favorite of my mom and mother in law for its effects as a natural sleep aid! According to Prevention magazine, “Cherry juice is a natural source of the sleep-wake cycle hormone melatonin and amino acid tryptophan…Proanthocyanidins, or the ruby red pigments in tart cherry juice, contain an enzyme that reduces inflammation and decreases the breakdown of tryptophan, letting it go to work longer in your body,” Read more at Prevention Magazine’s website. I make sure to add healthy fats and fiber to the smoothie by adding chia seeds. This allows your body to naturally absorb more of the fruit’s nutrients. I personally don’t eat Greek yogurt anymore but my husband still loves it. We like Siggi’s Icelandic yogurt because it is very low in sugar. I like to add Plant Based Protein powder or more chia or hemp seeds to add some protein to my recovery smoothies. You might want to add a little sweetener to your smoothie if it is too tart for you! We like to use local honey or liquid Stevia. Don’t forget…frozen fruit is the trick to a perfect smoothie! Not only is it cheaper, but it is how you get a thick, cold smoothie without watering it down like you do by adding ice. A yummy, refreshing, antioxidant packed recovery drink! Place frozen fruit in Nutibullet cup or blender. Pour in enough juice to cover the frozen fruit (we use about 1 cup). Put in yogurt, chia seeds, and honey. Blend for about 1 minute or until desired consistency. Top with fresh berries or enjoy as is! He is one happy guy!! 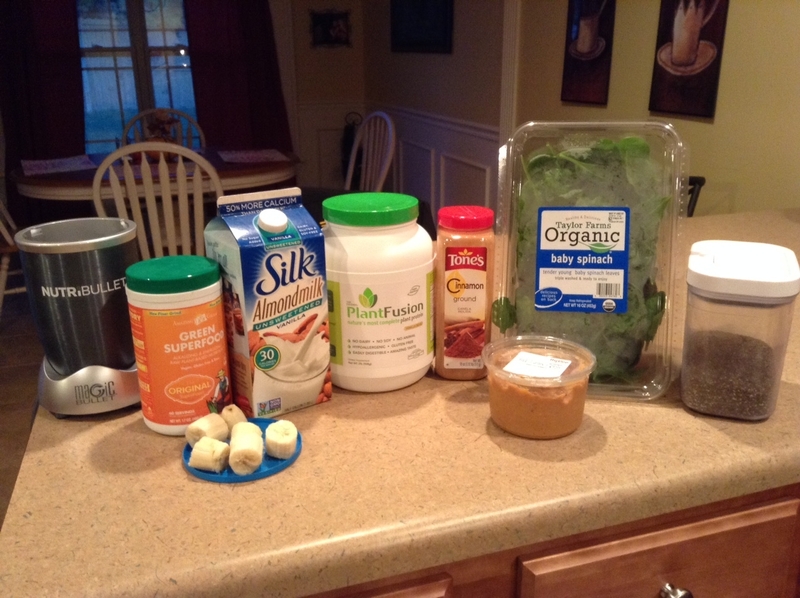 Peanut Butter and Banana Green Monster Smoothie! 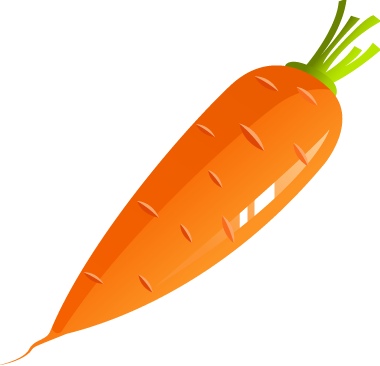 This summer, I listened to an online web conference put on by the Institute for the Psychology of Eating. One of my favorite presenters was a registered holistic nutritionist and renowned fitness expert named Yuri Elkaim. Yuri is a major proponent of eating a diet containing primarily alkaline foods. You can find more information on this topic in his book, The All-Day Energy Diet. In order to make it through a busy day in Kindergarten, I need something in the morning that will keep me feeling full, alert, and energized. Yuri highly recommended a green smoothie in the morning to set the tone for a day full of energy. 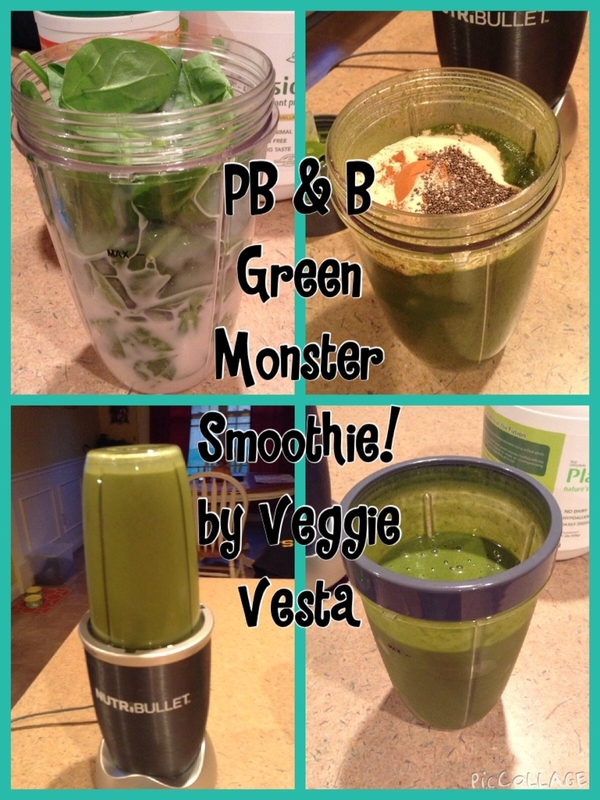 I started “Pinterest”ing green smoothie recipes and found lots of “Green Monster” smoothies! Chia seeds and freshly ground peanut butter add healthy and filling fats. Yummy almond milk provides a sweet and creamy calcium source while cinnamon provides blood sugar stabilization. It has become a regular breakfast and post workout choice for me! I feel like it has made a dramatic difference in my energy levels! I highly recommend it! 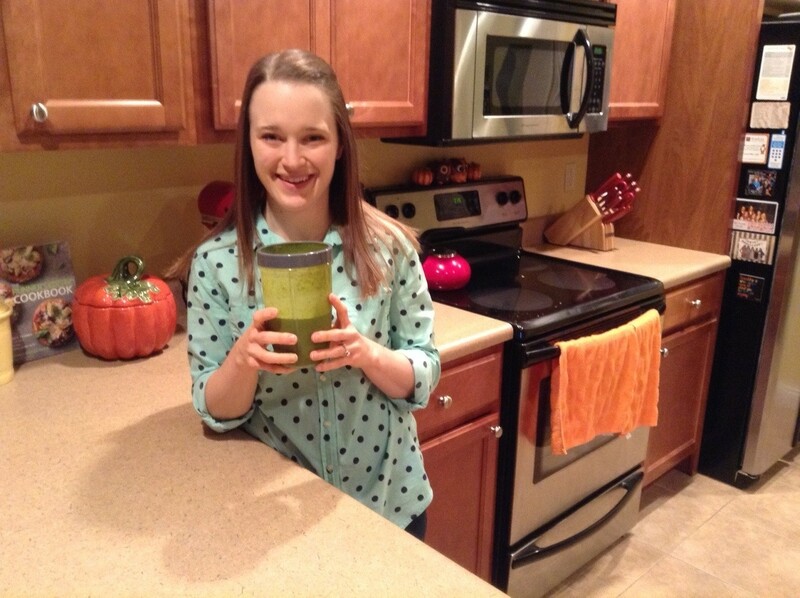 Peanut Butter & Banana Green Monster Smoothie! A great, filling breakfast or post workout smoothie full of healthy fats, protein, and plant based, whole food nutrition! Add spinach, Green Superfood, and almond milk to blender or Nutibullet. Blend until smooth. Add in all of the other ingredients. This is also great with chopped, frozen or fresh kale! 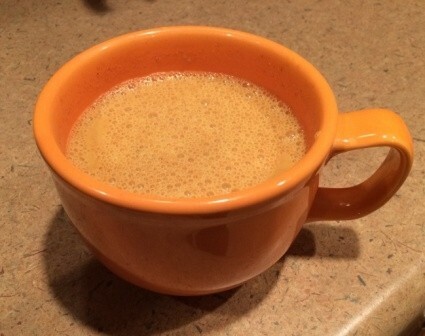 Turmeric Milk: An Anti-Inflammatory Treat! I love running. I love BodyPump. I love working out. Sadly, over the last few months, these wonderful passions of mine have been extremely painful. I have been struggling with a tremendous amount of pain and discomfort in my feet. The frustrating part for me is not just the pain, but the time and money I have spent through the recovery process. I have sought many different treatments, but no one has quite known what is wrong with me. I don’t fit the typical mold. My pain has been shifting and confusing doctors and specialists. It has been extremely frustrating and has taken me away from many of my favorite activities. It has not only been a struggle physically, but mentally as well. Check out her blog post here: http://ultramaxsports.com/amyblog/make-the-most-of-being-injured/. Exercise is a wonderful outlet for stress relief and enjoyment but I have learned that I can not let it become an ultimate thing in my life. I want my motive for exercise to be because it makes me feel good and it keeps me strong and healthy, not because it provides value, contentment, or purpose. I have learned that I need to trust God and his timing. His perfect plan is making me into the person He wants me to be. He is using this situation to bring me closer to Him and I need to continue to have faith. My tendency is to try to fix things myself. Luckily, God humbles us and allows us to see that this never works. By the grace of God, I was provided with some answers and a solution. God has put people in my life who are willing to help me get better and who care about my recovery. I finally feel like I have hope and that I will get better. And for the first time yesterday, as ugly and as uncomfortable as it was, I was able to run. Do I feel 100%? No way…BUT I know I am finally on my way and I have finally put this into God’s hands. Now, back to the reason you are reading this post!! During my recovery process, I have been doing a lot of research on natural pain relievers. One common theme through my research has been inflammation. One recipe that intrigued me was a recipe for turmeric milk. I love a hot drink before bed so I thought it was worth a try. I tried it and loved it! My recipe is a take on the recipe from Choosing Raw. It has yummy cinnamon, turmeric, and ginger. You can’t forget to add a little sweetness with some local honey. Hope you like it! Heat almond milk in microwave for 2 minutes in a mug. Stir in spices and honey with a spoon or small whisk. Optional: mix spices and milk in a small blender or NutriBullet before microwaving for 2 minutes. Add honey after microwaving. I can’t say the words “Sloppy Joe” without singing the song or thinking about Adam Sandler! Here are some YouTube videos for your entertainment if you don’t know what I’m talking about! I have always loved an extra sloppy, Sloppy Joe! As I have previously mentioned, I also LOVE the clean eating blog The Gracious Pantry. She has some awesome recipes to choose from that are simple and tasty! 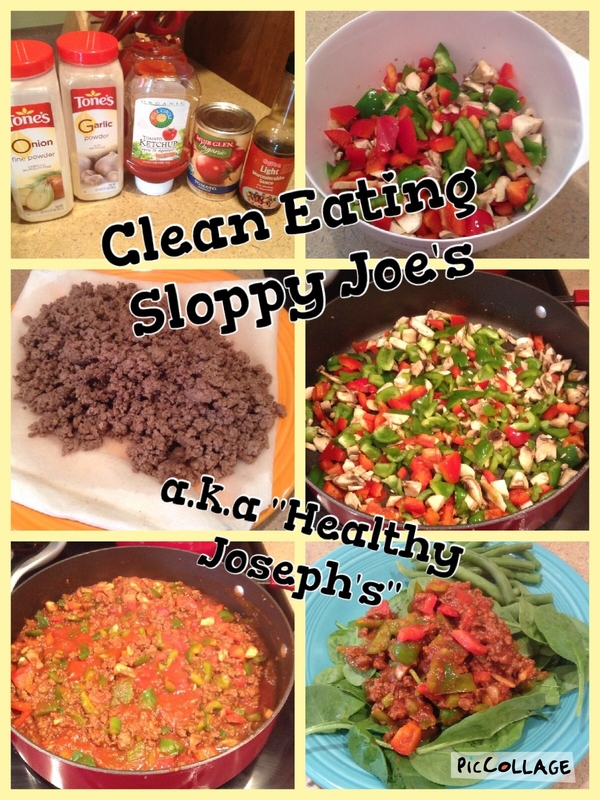 One that we make on a regular basis is her version of clean eating Sloppy Joe’s. Phil and I both grew up on Sloppy Joe’s, however, these “Joes” were from a can mix or filled with brown sugar. From the Gracious Pantry, I have learned that you can make a healthy version of this recipe just as easily! Phil decided that since the recipe was a healthy twist on the original version that it needed a different and more sophisticated name…Healthy Joseph’s stuck at our house (since Joe needed to be taken more seriously, he decided to go by his full name). I adapted the Gracious Pantry version just a bit to make it my own. Her version is just as tasty! I added mushrooms and some Worcestershire sauce. Sometimes I will do all green pepper if I am out of red pepper. I usually use lean ground turkey but on this night I was out so I used local Show Me Farms ground beef. It is the best beef I have ever had…hands down! We love to make this on a night that we are running low on time or need to use up some old veggies. I love to eat this meal with sweet potato fries or mashed sweet potatoes! Phil likes to make his extra sloppy on a whole wheat bun with some cheese. Chop veggies to desired thickness. Spray olive oil in a large pan, add the turkey meat and cook over medium heat. Scoop and get real sloppy with a clean hamburger bun or a bed of baby spinach. For the past couple years, I have tried to eat multiple small meals a day in order to stabilize my blood sugar and boost my metabolism. These meals average around 250 calories and have a balanced amount of protein, healthy fats, and carbs. Since my lunch break at work is around 10:30 am (more like brunch) I am often hungry again by my plan time (1:30 pm). I quickly found this to be the perfect time to have a small meal or snack! However, snackers beware!!! You have to be prepared so you are not snacking on the wrong things! It is easy to find healthy snacks like raw veggies or a piece of fresh fruit BUT often difficult to find snacks high in protein. Because of this, I am always in search of filling snacks to take to work that are also a good source of plant-based protein. Luckily, Pinterest has introduced me to numerous food blogs, providing me with some great resources to relieve my hunger pains! One of my favorite food blogs of all time has to be Oh She Glows. It is a great place to find meat and dairy-free recipes! Many of her recipes are also free of gluten, soy, and processed foods. 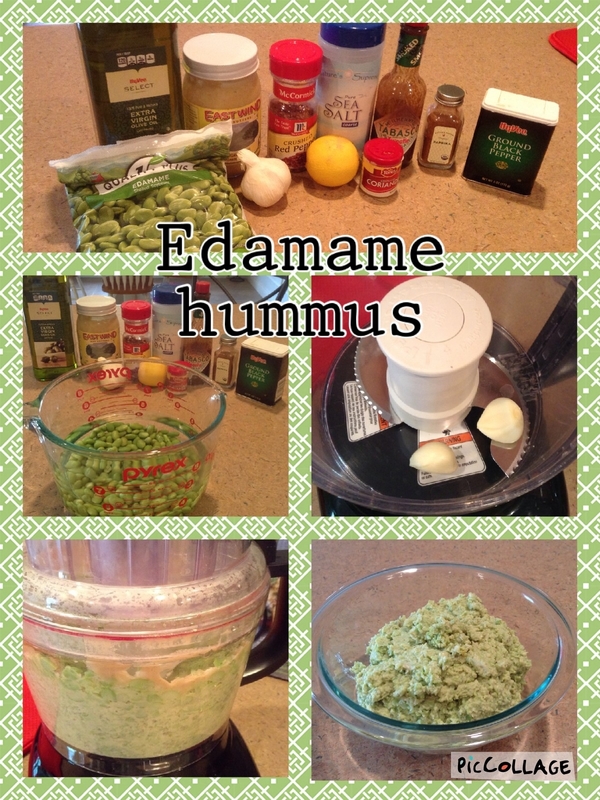 On her blog, I found a recipe for Edamame Hummus. I first tried edamame hummus at an Asian bistro in my town and it was delicious! I knew edamame is a great source of protein, but I often did not take the time to prepare it at home. This recipe creates a satisfying dip with just a little bit of heat at only 100 calories per 1/4 cup serving! The hummus is a great source of protein and vitamin C and also provides some calcium and iron. The olive oil and tahini (ground sesame seeds) give you a dose of healthy fats that leave you feeling full until dinner. Tahini, just like any nut butter, is easy to make at home. I found mine at HyVee in the nut butter section of the health food department. Put all of this together and you get around 12 grams of protein per serving! That is like eating a protein bar! A yummy mid-afternoon snack packed with plant based protein and healthy fats! Rinse and drain edamame before using. Cook frozen edamame according to package. I cook mine in the microwave with water for 12-15 minutes, stirring occasionally. Rinse and drain before using. Optional: Set aside a handful of edamame beans for garnish just before serving. With motor running on food processor, drop in 2 garlic cloves to mince. Next, add edamame to processor and process until somewhat smooth, stopping to scrape down the side of the bowl as necessary. Add in the lemon juice, tahini, and vegetable broth or water (I will sometimes use the water I cooked with) and process again until smooth. Don’t be afraid to let the processor run for a few minutes and get it really smooth! Add salt to taste along with optional seasonings. Process again until combined. Scoop into a serving bowl. Stir in optional 1 tbsp of hemp seeds. Garnish with extra smoked paprika, freshly ground black pepper, olive oil, or reserved edamame. Serve with broccoli, carrots, toasted pita chips, and/or crackers. For Christmas this past year, my mother in law got me a great gift….The Best of Clean Eating Cookbook with recipes from Clean Eating magazine!!! Talk about the perfect cookbook for me! Upon receiving this gift, I think I read through every recipe! 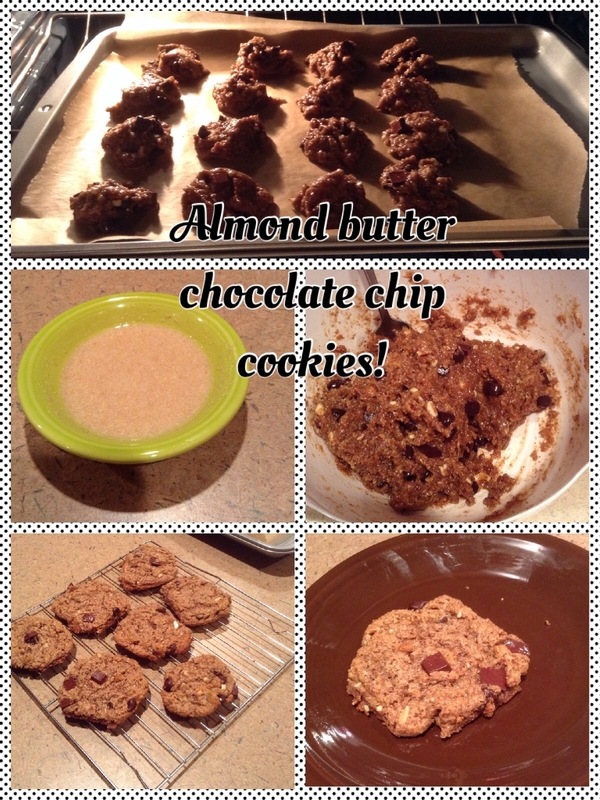 There was one yummy looking recipe that was a “reader favorite” for an almond butter chocolate chip cookie! Who doesn’t love a good chocolate chip cookie?!? I was excited to try this new sweetener! However, I could not find Sucanat in my local health food stores. I actually had to order it online! I wanted to make these cookies right away so I decided to change it up a bit so I could try the recipe before my order of Sucanat arrived. I thought to myself, there are so many sugar substitutes…why not try my own combination? I decided to use the next best sugar I could find, an organic raw cane sugar. On my sugar exploration, I also discovered coconut sugar. According to the Big Tree Farms Organic Coconut Palm Sugar package, it is produced by tapping the sweet nectar from the tropical coconut palm tree flower. Unlike regular sugar, coconut palm sugar has a low glycemic index and is high in nutrients like magnesium, zinc, and potassium! It also has 16 vital amino acids. Because it is low glycemic, you won’t get that “sugar crash’ other sweeteners give you. Oh yeah, and it’s super tasty! I also always have a local raw honey in my pantry! I decided I would use a little of all 3 and see how it turned out! The verdict? AMAZING! I loved the combination of raw cane sugar, coconut sugar, and honey. Once my Sucanat came in, I followed the recipe exactly and actually liked my variation better. Now I like to use part Sucanant, part coconut sugar, and part honey. I have also subbed peanut butter for the almond butter…which is pretty darn good as well! I realized that using a flax egg for cookies is genius! Why? Because you can safely eat the cookie dough!! Mmmm! If you want to make your own almond butter for this recipe, check out my post for Almond Butter Protein Dots with an added recipe for homemade almond butter!! Eight ingredients, two steps and 20 minutes is all you'll need to whip together two dozen no-flour, dairy-free, low-sugar cookies. Preheat oven to 350°F. In a medium bowl, stir together ingredients (excluding the chocolate chips) until blended. Drop dough by rounded tablespoonfuls onto parchment-lined baking sheets. Bake for 10 to 12 minutes or until lightly browned. Let cool on baking sheets for 5 minutes. Remove to a wire rack and let cool for 15 more minutes. I love stuffed green peppers and have often seen them made using a rice and ground beef base. Quinoa is not only a great plant based protein source but it is an awesome rice substitute within a recipe. 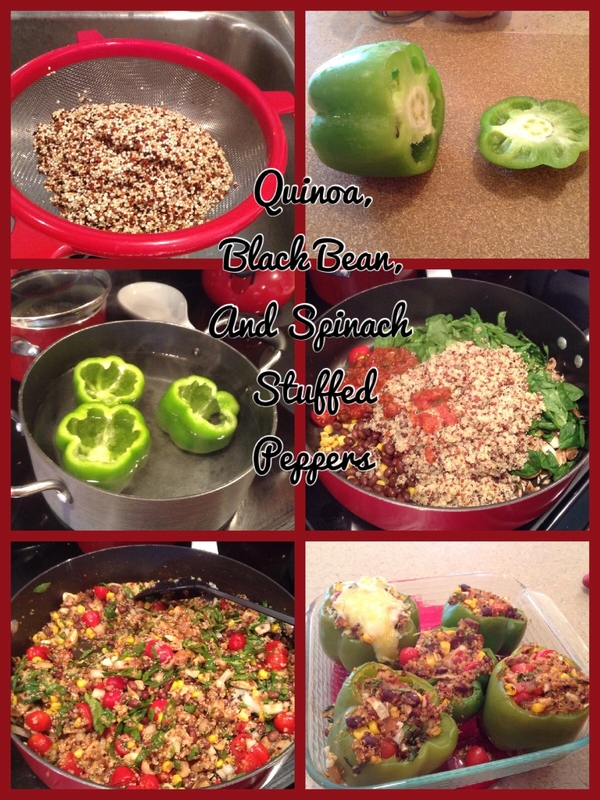 I will often use brown rice and ground turkey in my peppers, but if I ever want to shake things up a bit, I love to use quinoa! We loved it but we noticed that the peppers were too hard to cut through when eating. I read in one of the comments about how boiling the peppers will make them just soft enough to cut through but not too soggy! Ever since reading that comment, I have always pre-boiled my peppers before stuffing and baking them. You don’t need to boil them for very long, maybe about 10-15 minutes depending on how many you are using. When making this seasoning, I like to make a large amount to keep in the pantry. I usually make the “1 part” = 1 tablespoon. I store this mixture in a small plastic container with my other spices and then pull it out whenever I am making a Mexican dish! My stuffed peppers are LOADED with veggies! I love to count and see how many veggies I can fit into one recipe. This one…6+!! Talk about nutritious and delicious!! I like to use yummy local or organic salsa and tons of spinach! I will usually use whatever veggies I have laying around the house. For this batch, I didn’t have my usual cilantro and zucchini add-ins but I did have mushrooms…why not?! Still tasted great! Rinse quinoa in a small fine wire strainer. Place into a small pot with 2 cups of water. Bring water to a rolling boil. Reduce to simmer, cover, and continue to cook quinoa according to package until fluffy (about 15 min). I occasionally stir the quinoa while it is cooking so it does not stick to the bottom of the pan. Prepare a large pot of boiling water for the peppers. Boil the peppers in a large pot for about 10 minutes. Most of the time I will only cook 4-5 peppers and eat on the stuffed pepper mixture throughout the week on top of a bed of baby spinach! Remove the peppers out of the water using tongs and place on a paper towel to cool. Cut up the onion, tomatoes, and zucchini into small chunks. Place into a large non-stick frying pan with corn and rinsed beans. Coarsely chop spinach and cilantro before placing into pan. When the quinoa is done cooking, add to the large pan with other ingredients. Add lime juice, spices (taco seasoning), and salsa to taste. Put some of the mixture into each of the peppers. Top with optional cheese if you would like. Place pan in the 350 degree oven for 20-25 minutes. I like to cook an additional 5 minutes on low broil. Phil loves it when I mix in leftover turkey taco meat! It is a great way to add some protein and make the meal more filling. Enjoy!! I am all about comfort food! I get even more excited when I can make comfort food into a healthy and nutritious meal! When I first got married, I was on a mission to find healthy recipes Phil would love. I thought, “What man doesn’t love a good meatloaf? !” Heck, even though I eat mostly veg…I love a good meatloaf too! Over the last few years, I’ve tried various combinations of meatloaf recipes and I’ve liked bits and pieces of each one. I found it was extremely easy to sneak veggies into meatloaf and that turkey meat made for a tasty, “melt in your mouth” bite! Most of the recipes called for bread crumbs only but I loved how my mother in law, Kris, used oatmeal in hers! Genius! Therefore, I decided to do a combination! All the veggies add a nice crunch as you are eating. Green pepper, onion, and carrots are a must in this dish! I also love to add any extra veggies I have laying around the house like mushrooms or zucchini. This recipe is one of our favorite main dishes and we love to serve it up with my baked sweet potato fries! I like to think that this recipe is a true Veggie Vesta original creation! I’ve had lots of teacher friends ask for it so I just had to add it to my blog! Preheat oven to 350 degrees. Take a glass baking dish (I use 2 quart size) and lightly spray with cooking spray/oil. Combined all ingredients together by hand in a large bowl. Form into loaf and place into pan. Pull out and cover in BBQ sauce or ketchup. Place back into oven for 5 more minutes. If you use 93/7 ground turkey then it is about 215 calories for 1/8 of a loaf. If you use 99% fat free ground turkey then it is about 170 calories for 1/8 of a loaf. If I am not using ground turkey thigh, I use the 99% turkey meat. This will have about 3 grams of fat, 18 grams of protein, and 17 g of carbs per serving. Hi everyone! I'm Vesta! I am a Kindergarten teacher, wife, beagle mama (this is Henry, my adorable hound dog), exercise enthusiast, runner, and clean eater! My goal for this blog is to provide you with healthy, clean eating recipes packed with nutrients and flavor! Whole, real, healthy meals don't have to be boring and tasteless! I’m not a chef, nutritionist or dietitian. However, I do have a passion for foods that taste great and make you feel great! Clean eating is not my diet...it's my lifestyle. Enjoy! Summer Pickles! | Veggie Vesta on Turmeric Milk: An Anti-Inflammatory Treat! 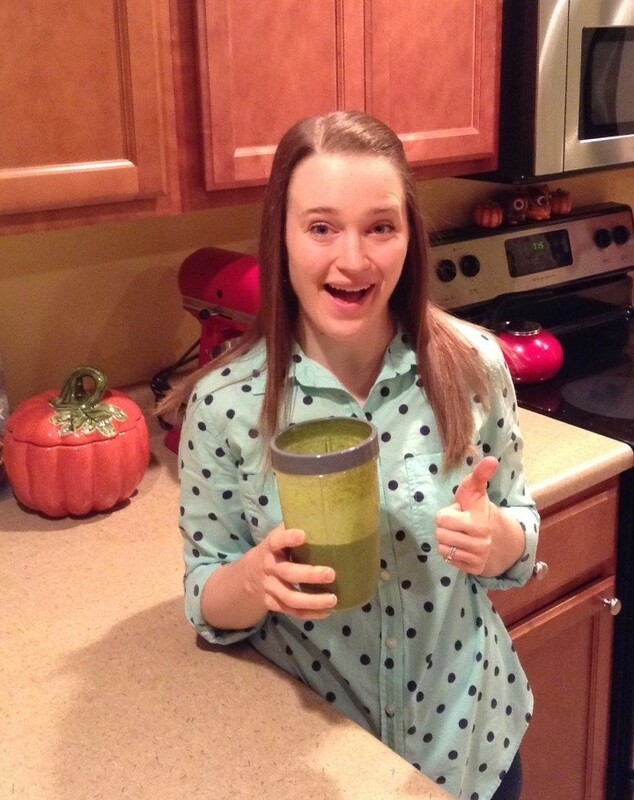 Teresa Green on Peanut Butter and Banana Green Monster Smoothie! 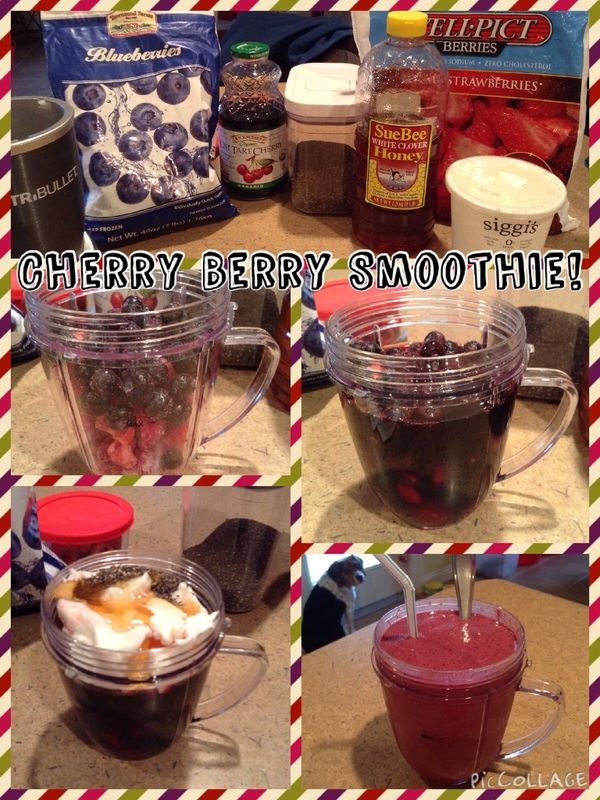 Teresa Green on Cherry Berry Smoothie!